The End of a Stable Climate? In blue is the temperature reconstruction, based on results from the analysis of ice and sediment cores from around the world. In red is the projected warming, based on scientific literature. The reconstruction illustrates many important points. First, our modern society has evolved (over the past 10,000 years) in a relatively stable climate. 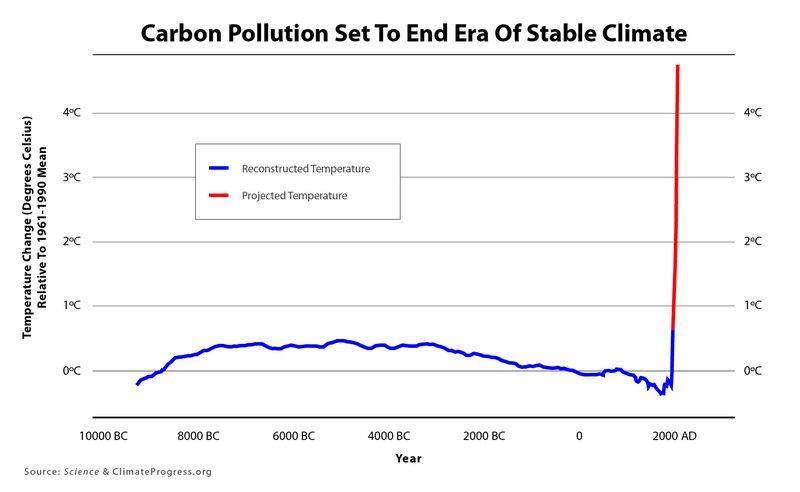 Second, the planet is warmer today than it has been during 70 to 80 percent of the last 11,300 years. Interestingly, during the past 5,000 years, the Earth cooled about 0.8 degrees Celsius (1.3 degrees Fahrenheit). However, it has warmed by about the same amount in only 100 years. In other words, due to our emissions of carbon dioxide (and other greenhouse gases), the temperature in the last 100 years has changed 50 times faster than the period during which our modern civilization (and the agriculture that feeds it) developed. I would add that this incredible rate of change not only challenges our adaptive capacity, but nature’s as well. Evolution through natural selection is a process that, for the most part, happens slowly. Over thousands, if not millions of years. That is why scientists believe that 40 to 70% of all species on Earth could go extinct if the globe warms by 4 degrees C (above pre industrial temperatures). We know what the threat is (climate change). We know what the solutions are (renewable energy, energy efficiency and energy conservation). We have the technology (wind, solar, geothermal, smart grids, electricity-powered transportation, LIGHT SWITCHES!). All we need now is the political will to act. I think I’m going to go write a letter to my local MP. It has been decided to set the [decarbonisation] target in 2016, once the Climate Change Committee has provided advice; in line with the fifth Carbon Budget which covers the corresponding period. It is right to fix the target in terms of the prevailing circumstances at the time and in the context of the economy as a whole to which decarbonisation of the sector is inextricably linked. In other words, in the UK we’re all set for three more years’ delay, inaction and procrastination. They are “kicking the can down the road”, as American politicians like to say. Well that is incredibly disappointing. Okay, I know I’m being lazy and re-blogging, but really, if it’s well-said and to the point, why not share it?